Grey London has scooped a Gold Lion at Cannes for Design as part of a hat-trick of awards in the category. 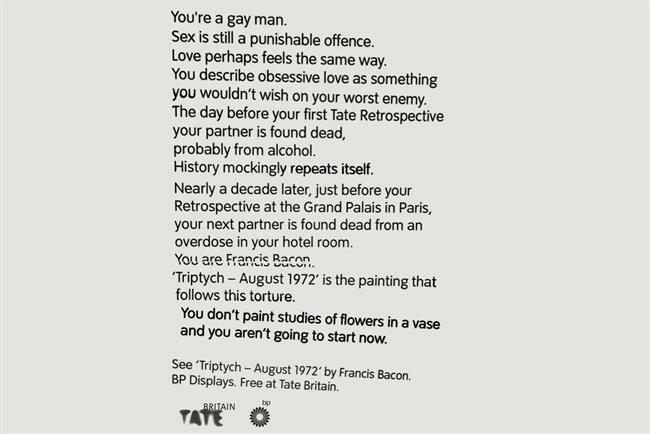 The WPP shop won a gold Lion, a silver Lion and a bronze Lion for Tate Britain’s "500 years of stories", which tells the story behind great work in the museum’s collection. CHI & Partners won a silver Lion for the Lexus hoverboard campaign "Slide: Amazing in motion", which achieved international fame amid waves of news coverage. Brand strategy specialist The Partners also picked up a silver Lion for its "Simple value" work for Argos. ITV Creative won a bronze Lion for ITV2 idents, which were launched last year as part of the channel’s rebrand. Breakthrough London, the creative agency and production company, won a bronze Lion for the UK government’s "Educate against hate" campaign. Landor London, the brand consulting and design specialist, won a bronze Lion for "Dark London". The Design Lions Grand Prix went to Dentsu Tokyo for Panasonic’s "Life is electric", an animated spot which celebrated fine craftsmanship by featuring drawings of electric circuits and products by veteran illustrator Phillippe Weisbecker.